For this lesson, we are going to use the following example. The data don’t have to be highlighted. 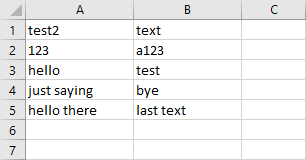 I did it so we can see where are the rows containing the “delete” text. 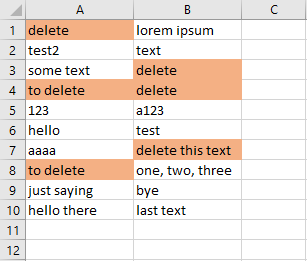 In order to remove rows containing the “delete” text. 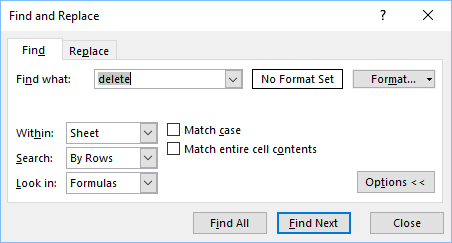 Click Find All, and immediately after that Ctrl + A. 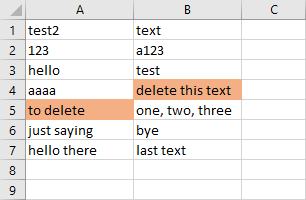 As you can see, all cells containing the word “delete” are removed. If you want to remove rows that any equals “delete” and not contain this word, you have to follow the same steps as you did before, but this time you should check the Match entire cell contents button. After you complete the remaining steps, you will get the following result. 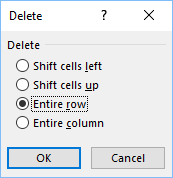 As you can see, now the rows that contain “delete” but are not equal to delete have been removed.